Lauren and Mark had their wedding ceremony and reception on a beautiful fall day in the Radisson Hotel at Star Plaza located in Merrillville, Indiana. 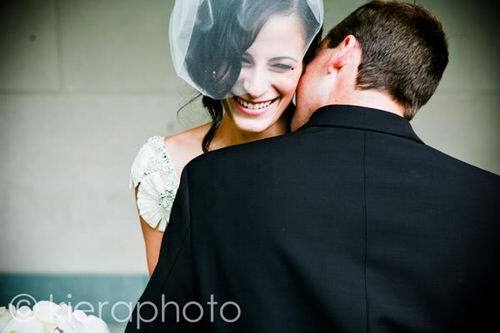 We captured all of the fun preparations as well as the first meeting with the bride and groom. Then, it was time for bridal party photos with photographer Mark Amelse. Consultant Jen Barnette of Four Leaf Events made sure the event went smoothly and even provided stunning purple uplighting for both the ceremony and the reception. Claire and Thomas had their gorgeous wedding ceremony and elegant reception at the Conrad Hotel. Special thanks to Amanda Coffey of the Conrad and Gene Huddleson of Detail + Design for referring the couple to us! The bride and groom had their “first look” on the hotel’s staircase followed by photos downtown with Andrew Scalini. The ceremony included wonderful personal touches, including hilarious vows written by Claire. Afterwards, the reception decor was absolutely stunning thanks to Detail + Design, KB Design and Classic Cakes. The Flying Toasters rocked the house, and Monica Richard of Detail + Design ran the day to perfection. The evening concluded with French fries and a swanky after party next door. Best wishes Claire and Thomas, and thanks for letting us capture your special day! Kimberly and Michael had a touching ceremony at Carmel Lutheran Church, and a beautiful reception followed at the Indiana Roof Ballroom. Between the ceremony and reception, we enjoyed getting shots of the bridal party around Monument Circle with photographers Nate and Tiffany of Nathaniel Edmunds Photography. Guests had great time dancing to music by Dwanna and the Primetime Band and posing for pictures in the Freezeframez photo booth. Very special thanks to family friend of the couple as well as their wedding coordinator Kathy Ray of the JW Marriott for the referral. 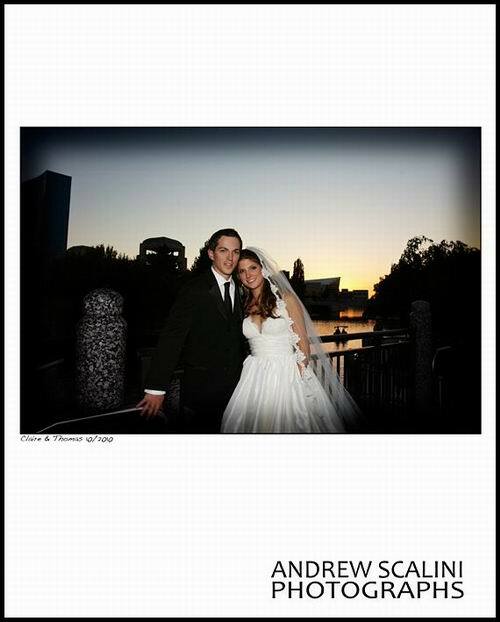 Rania and Jeff celebrated their wedding day at the Indianapolis Museum of Art. Although the weather that day was dreary, it didn’t dampen their spirits in the slightest. The warm feeling of love surrounded the beautiful couple as we captured their “first look” and bridal party photos with talented photographer Kiera Dubach. Since the couple met on the tennis court, some fun touches included pictures taken with tennis rackets and a groom’s cake in the shape of a tennis ball. The ceremony and reception went flawlessly thanks to fabulous coordination by A Touch of Elegance, and all of the florals from Palmer Kelley were just stunning. Kahn’s Catering provided an unbelievable array of delicious food, and Mike Degler of SDI Sound kept the tunes spinning and the dance floor full. Thanks to Hope Oaks for the referral, and thanks to Rania and Jeff for inviting us to capture your special day. Best wishes to you always. Rebecka and Ryan planned a beautiful formal ceremony at Sacred Heart Catholic Church, involving many family members in the service. A fun reception followed at Jonathan Byrd’s. The night before, we filmed the rehearsal at the church and the rehearsal dinner at the Milano Inn. On the day of the wedding, we started bright and early with shots of the bride getting ready at the her parents’ home. Rebecka was one of the calmest brides Bob’s ever seen, even helping others get ready. After the ceremony, we went to Garfield Park Conservatory for bridal party photos with Daymaker Photographer and Design. The reception included a cute nurse and firefighter cake along with a giant candy station and chocolate fountain, with Party Time Sound providing the sweet party tunes! Congratulations to the happy couple! Jen and Zach had their wedding ceremony and reception at the Conrad Hotel. We enjoyed capturing this special day alongside Galleria Studios, and it was also great filming Casey Scott and Posh Petals‘ beautiful decor for the second straight weekend. At the reception, we loved Jen’s father’s toast when he gave Jen a rock that she’d given him as a child over 20 years ago! The Souled Out Band kept the crowd dancing all night, so it was a nice touch to furnish flipflops (organized by size) for all the guests. Plus, everyone liked the French fries provided as a late night snack. 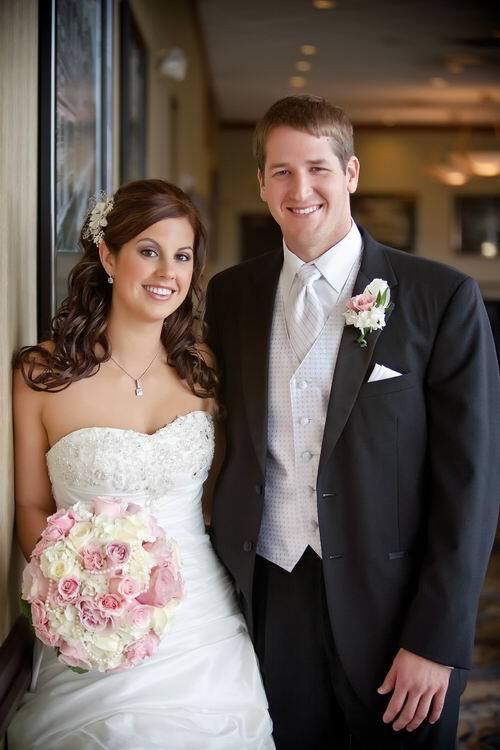 Special thanks to our IndyVisual clients, Blair and Michael, for referring the couple to us! Best wishes to Jen and Zach for a long and happy life together! 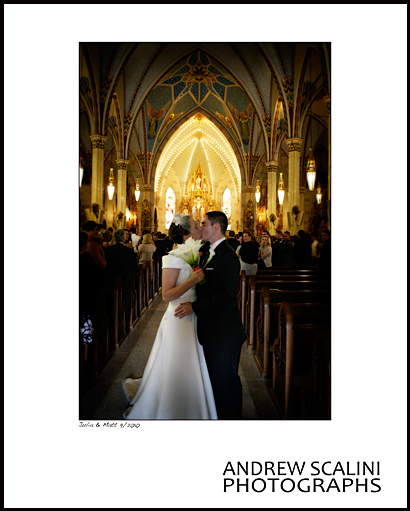 Julia and Matt got married at Sacred Heart Catholic Church and had their reception at the Columbia Club. We knew that the wedding party would be a fun group because the whole family cracked Bob up during the consultation! The ceremony included beautiful music by the church choir. Afterwards, Bob took a trolley with the wedding party to the Indianapolis Museum of Art for shots with photographer Andrew Scalini. The 10th floor ballroom at the Columbia Club had lovely decor thanks to Casey Scott and Posh Petals. The open dancing started with a surprise song from the bride to her mom played off of Bob’s iPhone. Zanna-doo rocked the house as always, and the guests loved the photo booth by Indy Photo Booths. Sally and Dale had their wedding ceremony and reception at Sangiovese Restaurant in Indianapolis on a sunny day in September. Our coverage started earlier in the day when the couple saw each other for the first time at the Flowing Well Park in Carmel. Darcie Kornmeyer from Circle City Planners (who referred the couple to us!) and photographer Jennifer Driscoll improvised this “first look” location, and it turned out beautifully. The bouquet was assembled from separate flowers (provided by Circle City Designers) that were carried in by their four children at start of the ceremony as a symbol of combining their two families. Their vows were especially emotional because Sally and Dale stood by each other “in sickness and in health” early in their relationship. The reception had a wine theme with decor to match, including grapes on Heavenly Sweets‘ cake. The night included lots of speeches by their closest friends and family and great music from the Cocktail Sax Band. Thank you Sally and Dale for having us capture your special day. You two are truly special people. Adorably sweet couple, Ellen and Mike, got married at Holy Trinity Greek Orthodox Church in Carmel, and the reception followed at the Mansion at Oak Hill where guests were greeted with favors of yummy Greek desserts at each place setting. DJ Joe Virgin kept the crowd dancing all night, and photographer George Abiad took a ton of photos of all the fun! 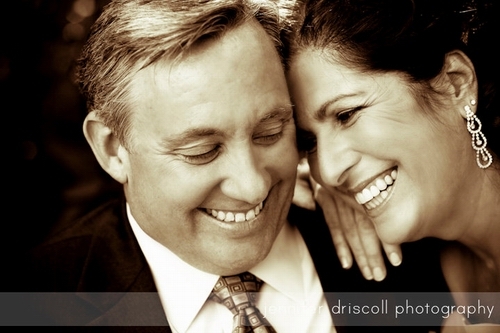 It’s easy to see that Ellen and Mike are just smitten with each other, and we loved capturing all of their tender moments. Congratulations to the happy couple! After covering the ceremony, we enjoyed working with photographer Matt Bowen while getting shots with the bridal party at Monument Circle. The flowers were provided by McNamara, and the cake was created by Classic Cakes. The evening’s entertainment was high-energy thanks to the Keith Claghorn Band. Tons of fun dancing and singing ensued, complete with a father-daughter dance fakeout and sorority serenades. Best wishes to the happy couple, Brianna and Alex!